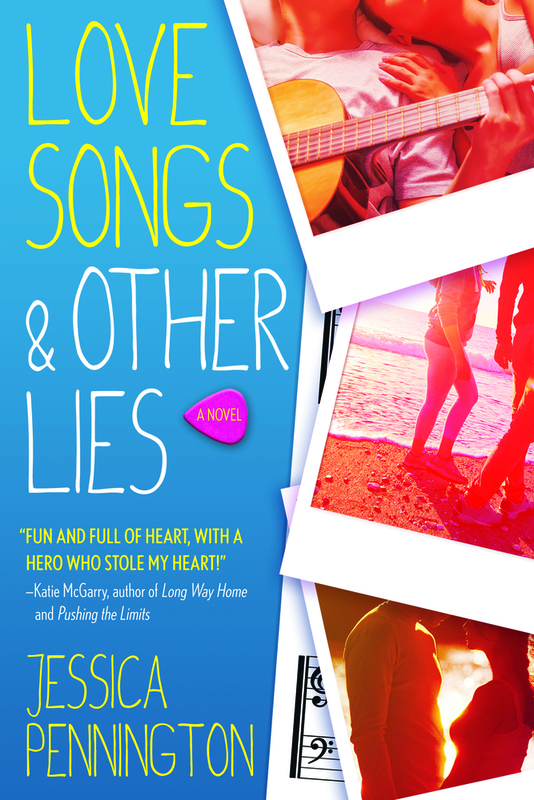 I have been excited to read Jessica Pennington’s Love Songs & Other Lies the moment I heard about it last year, so I jumped at the opportunity to join Jessica’s street team. I was lucky enough to snag an ARC (and meet Jessica) at ALAMW, and I started the novel on my plane ride home! Love Songs & Other Lies is told through alternating POVs and timelines. Vee has everything planned out—she knows what college she’ll attend, what major she’ll choose, and what career she’ll pursue. She’s a talented songwriter and is perfectly fine with staying off the stage and managing her best friend’s band. Cam, on the other hand, has no plan other than to make sure no one finds out the real reason behind why he moved to the small town of Riverton, Michigan. As Vee and Cam become friends and more, Cam pushes Vee outside of her comfort zone by helping her form her alter ego, Dakota Gray. Vee tries to uncover the real Cam, but soon the guilt from his past is too much to handle and he suddenly leaves Vee in the middle of their senior year. Two years later, Vee joins her best friend’s band on tour as they participate on a Battle of the Bands reality tv show. The downside of what should have been an awesome summer? Her ex-boyfriend that she hasn’t heard from in two years is in the band. Vee is still angry about Cam’s disappearance and wants nothing to do with him whereas Cam will do anything to try to earn her forgiveness. The novel switches back and forth between past and present as Vee and Cam’s story unfolds, falls apart, and comes back together again. I loved the alternating timelines aspect of the novel. I couldn’t get enough of both stories and was so enthralled by what would happened next in both timelines. The way different aspects of Vee and Cam’s story is revealed is timed perfectly, and I loved seeing what characteristics were different in their older selves and what aspects stayed the same. Both settings are fantastic. In the past chapters, the story is set in a small town in Michigan with many late nights taking place on the beach. In the present chapters, the city is constantly switching as the band travels to new concert venues. The tour bus is a fun setting and the cameras add a new level of drama to awkward situations. The glimpses of the other bands and production team were great details and made the filming of the tv show feel real. Overall, I adored Love Songs & Other Lies and it will be making a home as a new favorite on my bookshelf. Full of love, heartbreak, and music, this is one debut novel you do not want to miss! I knew little about this book, but your review definitely sold it for me. I also love that Adele and Paramore reference. Eeep so glad to hear this! I really do hope you check Love Songs & Other Lies out! It’s been one of my favorite reads this year!